We are a leading Exporter of dutasteride soft gelatin capsules 0.5mg and mycophenolate mofetil tablets from Nagpur, India. 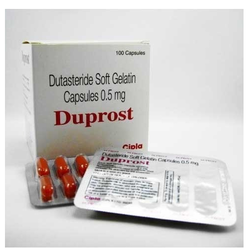 Duprost Dutasteride Soft Gelatin Capsules 0.5Mg offered by us is asynthetic 4-azasteroid compound, which is a specific inhibitor of both the type 1 and type 2 isoforms of steroid 5-alpha reductase (5AR). 5AR is an intracellular enzyme that converts into 5-alpha dihydrotestosterone (DHT). DHT is the androgen that are primarily responsible for initial development and subsequent enlargement of prostate glan. Mycophenolate is used in combination with other medications to keep your body from attacking and rejecting your transplanted organ (such as kidney, liver, heart). It belongs to a class of medications called immunosuppressants.